When I was a teenager, I made a needlepoint pillow from a kit. My mom kept it while I was away at college, but after that she cleaned house and gave it back to me. Although I expected that I would find a nice place to put it someday, it never seemed to match anything in my house quite right. So it ended up sitting at the back of my closet for over 25 years, even after I moved from one house to another. I thought of it as something I should keep because of all the time and effort I had put into making it. But this week when I considered it, I realized that no matter how I might decorate my house in the future, I still wouldn’t want to display the pillow because it’s so full of stagnant energy. It doesn’t fit the person I am now—I haven’t done any needlepoint in ages! 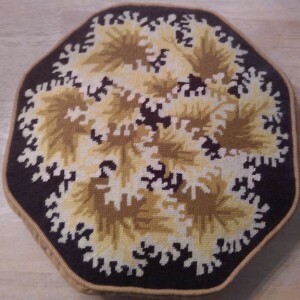 Even if I bought something new and the pillow matched, it wouldn’t feel like a cherished possession, but would remind me of old stuff sitting around in the closet. So it’s just got to go! I am so digging the clutter comedy Sunday, haha that’s so fun! And you know what’s wild? This morning I was asking the Universe to awaken me to some serious joy in life to kick off the year – and she delivered me your comedy! Love it. Have an awesome Sunday, my good friend, cheers to moving ONWARD!